This is exactly the position that I want to find myself in. 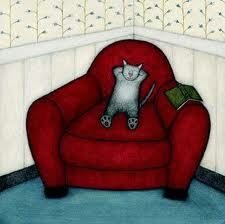 Curled up in a plushy sofa with a good book. But what book would I be reading? Since the onset of the Korean drama craze, I find reading to be an activity that happens for 5 minutes before I fall asleep in bed at night. The husband thinks that watching all those Korean dramas has obliterated my brain cells and made me…..dumb. The reality is this. For a long time, I ran out of books that I really want to be reading. I walk into Kinokuniya and feel completely lost. I have no idea how to browse the shelves lined with books and look for something that may be a riveting read. Then I discovered book blogs. Book blogs have been around for ages. But why is I have only recently known how wonderful these blogs are? They are a great resource for someone like me who is desperately in need of recommendations on what to read. Of late, I have been delving into The Literary Stew and The Reading Life. These blogs have a simple and clean layout without too many blinking widgets cluttering up the space. The writing is direct, concise and unpretentious. Both blogs recommended the book The Elegance of a Hedgehog written by Muriel Barbery, a French novelist and professor of philosphy. I am intrigued after reading the book’s synopsis. So I reserved the book through the National Library website – something which I haven’t done in ages and have forgotten the simple pleasure of picking up a book from the library. I should get off the computer and go read something.